Next in the series on Halal Jerky is this Hot Hickory variety. See my previous reviews of their Original and Teriyaki varieties. 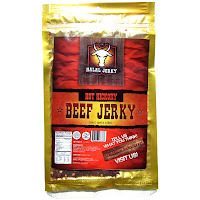 Halal Jerky is a brand of Halal Jerky, LLC based out of Corona, CA. It's a new brand having launched in February 2010. The name "halal" refers to any product or activity that's in compliance with Islamic Law. In the case of meats, animals must be "zabihah", which is a specific method and ritual in which animals are slaughtered. The folks at Halal Jerky, LLC claim that they have personally inspected the way in which cattle have been slaughtered, and their packaging carries a Zabihah stamp. Beef, soy sauce, spices, liquid smoke, vinegar, sodium nitrite. The first thing I taste from the surface of these pieces is a moderate salty flavor, followed by a smoky flavor. A light bit of burn starts building soon after. There's also a meaty flavor with some garlic mixed in. 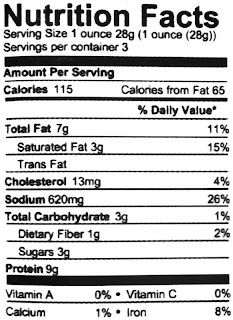 The chewing flavor starts with a stronger saltiness, a more defined soy sauce flavor, along with some natural meat flavors mixed in. The burn builds just a little bit more. For being labeled as "Hot Hickory" this jerky seems to hold up somewhat. I do taste a smoky flavor reminiscent of hickory, but not all that well-defined. It's just enough there to notice, and for all I can tell it might be the same level of smokiness as with the company's Original variety. But there is a decent amount of heat in this generated by the red pepper flakes. On my personal heat scale, it seems to rate about medium (level 3 out of 5). And those red pepper flakes seems to add a touch of chile pepper flavor too. Otherwise, the flavor that seems to represent this jerky over the others is the soy sauce and saltiness. That's comparable to the company's Original variety, but in this case with some red pepper flakes to add some heat and a touch of extra flavor. The level of saltiness in this feels like it's at a high level. The natural meat flavors are noticeable, but still light overall. There's also a little bit of fatty flavor in this, particularly where I chew into a streak or spot of fat. I can also pick up a touch of garlic too. Overall, what you're going to taste in this is a salty, soy sauce flavor, with a fair amount of chile pepper heat, but a touch of chile pepper flavor, along with a light natural meat flavor, and light smokiness. These are slices of whole meat, sliced into thin slabs, and in small, medium, and large sizes. This is a dry jerky, with a dry surface feel. The slabs have only a little bit of flexibility, being more brittle unlike Halal Jerky's other flavors. It's very easy to tear apart with my fingers, and chewing seems easy. The chewing texture starts out feeling dry, but soft and pliable. There's only a little bit of initial chewing resistance, but it seems to chew down to a soft mass quite quickly. At that point, it has a steak-like feel, comparable to one cooked well-done, but still somewhat soft. These slabs are well marbleized with fat, and they do add a fatty flavor to the chew. 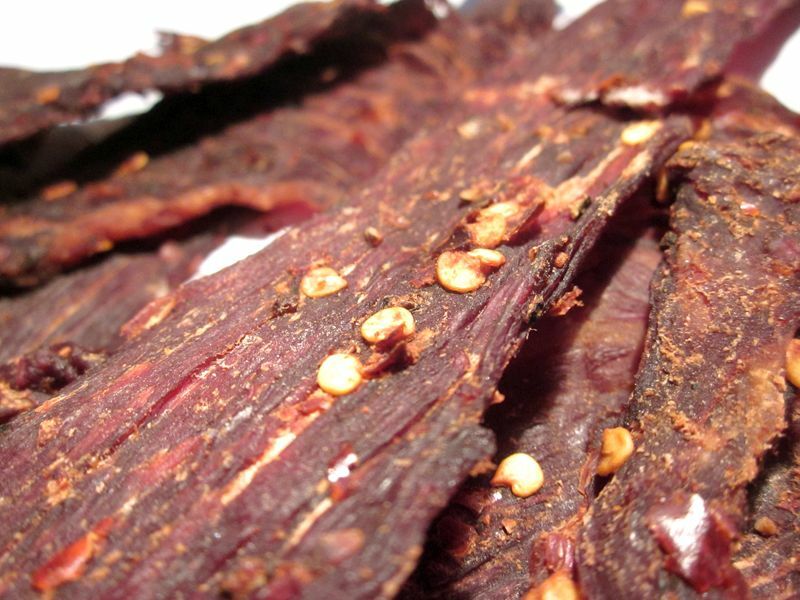 I also see significant streaks of gristle running through several pieces, which do add more chewiness, but being how dry this jerky is, it doesn't really hinder much. These slabs are also quite stringy, and seems to produce a lot of unchewable wads of tissue. As for clean eating, I get no residue on my fingers, but I found a lot of chile pepper flakes falling off as I tore pieces apart. 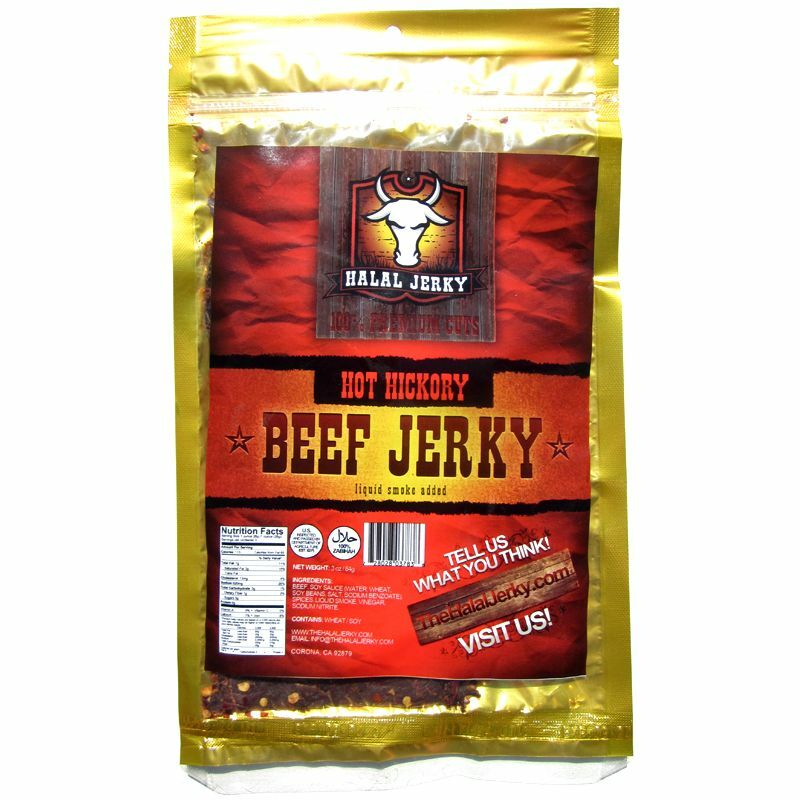 Halal Jerky sells this Hot Hickory variety from its Amazon store at a price of $5.99 for a 3oz package. They offer free shipping for orders of $25.00 or more. If you ordered five packages, it would work out to a price of $2.00 per ounce. For general jerky snacking purposes, at the $2.00 per ounce price, it seems to provide a decent value. I'm getting a good overall snackability for a good flavor, easy eating, and decent chewing texture. Compared to major brands of jerky you'd find at the grocery store, I think it's a slightly better value. As a Hot Hickory variety, also at the $2.00 per ounce price, it's a fair value. I'm getting only a light smoky, hickory flavor, and an moderate level of heat with a touch of chile pepper flavor. This Hot Hickory variety from Halal Jerky offers a salty, soy sauce flavor with a moderate level of heat and a light chile pepper flavor. 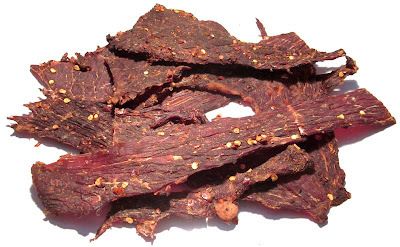 It does have a light bit of smoky, hickory flavor, as well as a light natural meat flavor, and is overall a flavorful jerky. It seems to live up to its advertised flavor, but doesn't nail it with any authority. But I don't find the flavor to be above average. In many ways, it's comparable to the company's Original variety, but with the addition of red pepper, and the subtraction of sugar. While the red pepper seems to have added a touch of flavor and fair amount of heat, it also tastes more salty. I actually think it tastes better than Halal Jerky's Original and Teriyaki varieties. There's also quite a bit of gristle on these slabs, and I encountered a lot of unchewable wads of tissue, which in my opinion drags this jerky down. My recommended beer pairing for this, go with a brown ale. Try a Newcastle Brown Ale, or the Big Sky Moose Drool.